The ability of obtaining the temperature distribution in an elastic continuum through the solutions of the heat conduction equation is an essential tool for the analysis of thermal stress problems. The analytical methods of solution of heat conduction problems may be classified as the differential, the lumped, and the integral formulations. This chapter presents the analytical methods of solution of heat conduction problems based on the differential and lumped formulations. Similar to the analysis given in Chap. 3, this chapter presents the method of analysis of heat conduction in three main classical coordinate systems, namely the rectangular Cartesian coordinates, the cylindrical coordinates, and the spherical coordinates. The temperature distributions in each coordinate system for one-, two-, and three-dimensional problems for steady-state and transient conditions are obtained. The temperature distributions in a number of structures of functionally graded materials are also presented. The basic mathematical techniques of solution are discussed. 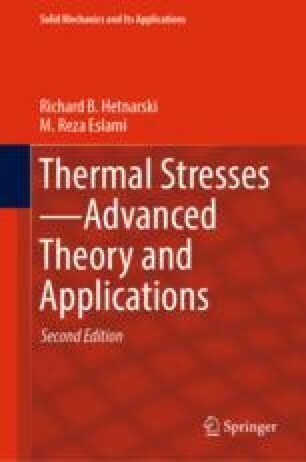 The extent of the heat conduction analysis given in this chapter should be adequate for further applications to various thermal stress problems.